To me, West Side Park is the Carle Park of Champaign. Every time I go to either of these parks, I go back in time. While Carle Park conjures up memories of my grandma, West Side Park makes me remember childhood moments with my mom. Swinging and singing together while watching the visiting preschool kids play. 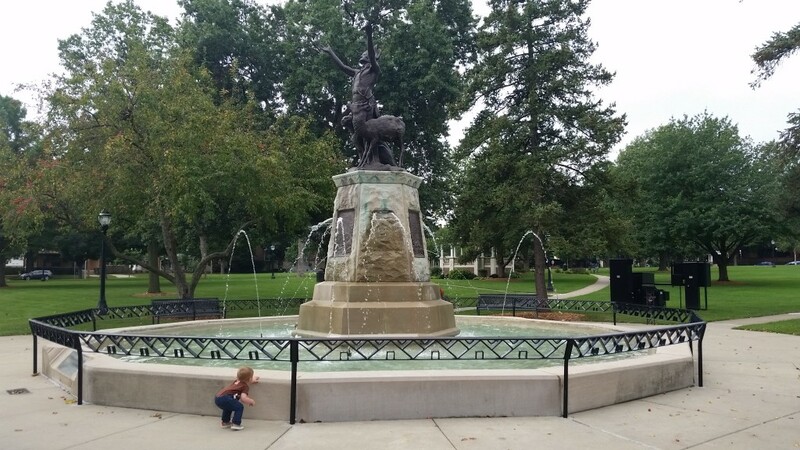 Get to know the historical West Side Park in downtown Champaign. Photo Credit: Emily Harrington. It’s another classic—historical even—mid-1800s park at 400 W. University Ave. There are no parking lots around the almost 13-acre property. Sitting on the edge of downtown Champaign, amid older homes and businesses, you can only find on-street parking. Try to find free parking on Elm Street first, if no luck move to State or Church Streets for metered parking. The metered parking is free on the weekends and there’s plenty of it. Multiple pathways dotted with old-fashioned lanterns and well-kept landscaping will lead you past multiple sculptures and statues. The statues were the most entertaining for my son and interesting for me. They all tell a story in history whether it be Abe Lincoln’s face or a little boy and his dog in bronze. My son found it especially interesting when bells chimed every 15 minutes from a nearby church. This charming sound only added to the historical ambiance. The playground is above average with slides varying in size, swings, a tube to climb in, a bridge and contraptions to spin and climb from. What made this playground go from above average to exceptional was the gate. It’s gated! I have an active toddler who can’t wait to leap from my arms and run from me, so any method of corralling is appreciated. After the playground we took a stroll (run) to the “Prayer for Rain” fountain. If it weren’t for the metal railing around the fountain, we would have both been soaked. He jumping in for pleasure, me jumping in to save him. Luckily, he was kept at a safe distance while watching the spewing water in awe and throwing leaves and sticks in the basin (sorry park district). While I was having this nice moment reading the plaque at the fountain—something occurred to me. Now, I am trying to say this in the most politically correct, diplomatic way possible—you’ll see all walks of life at this park. I did happen to sneak a peek at an older gentleman swigging from a flask at 10 a.m. around the fountain. Please don’t let that scare you—it was not as bad as it sounds. Consider it a lesson in diversity. After the man and the fountain, I was able to pull my son away from the water and head to our last stop—the bandstand. 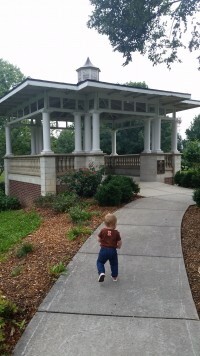 This beautiful stone gazebo is the perfect place for kids to play house in or play with the lock on the electrical box (which is what my little one was interested in). We came on a Saturday morning and there were very few kids here. I imagine when school is in students from the nearby high school filter down at lunch, so beware of your timing. Also, there are water fountains for your convenience, but no portable potties. I realize this isn’t the most practical omission, but it does make the park that much more attractive. All in all, I love this park and even its people. There’s so much to see and everything and everyone tells a story along the way. Take the opportunity to go back in time with your little ones at West Side Park. Emily Harrington is a Chambana townie that left her 8 a.m. to 5 p.m. job to be a 24/7 mom to a dreamy son. Still interested in writing, Emily uses some of naptime to practice her passion and keep her mind right. Emily is a happy wife with a happy life because she fell for a fellow townie. Oh, and let’s not forget her other son, a degenerate canine named Heppenheimer.